Black Panther heads back to New York City just in time to help Everrett K. Ross with his recent problems. But will T’Challa be able to return his friend to his true form… or will Ross be stuck as he is forever? And what does this have to do with the ancient and deadly menace of the Black Dragon? Guest-starring a plethora of heroes, including Colleen Wing, Misty Knight, and Iron Fist! Deadly Nightshade defeats Coleen Wing and secures the remains of the Black Dragon, a mythical creature from Kun Lun one of his peers is the very source of Iron Fist’s powers. She brings the creature back to life and codes a “genetic bomb” into his body to ensure that he co-operates with her plan. He however rebels immediately. Black Dragon ties up nightshade and takes the body of Everett Ross, friend of T’challa the Black Panther. 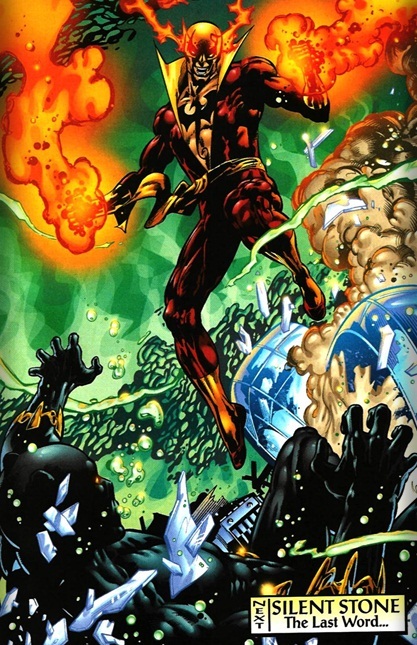 He also transforms Everett into a facsimile of Mephisto to throw Black Panther off his trail. Nightshade escapes and Black Panther makes Black Dragon’s life harder by destroying his “eggs”. This infuriates the dragon who takes control of Danny Rand/Iron Fist and send him to deal with the Black Panther decisively. Art-Not my favorite but very suited to the story unfolding on each page. Nightshade– Always a favorite of mine, this deadly lady has crossed paths with so many martial arts related characters and this issue finds her facing samurai Coleen Wing who she manages to best, a cool feat for such an underrated villain. Story- The Black Panther is one of the power players in the marvel universe and his nation Wakanda is in trouble once more, from within. The Panther has left his country in a state of seeming disarray with Henry Gyrich in tow and winds up tangled with the Black Dragon. Seemingly unrelated plot threads all tied together perfectly by Priest. Cover-Cool looking though unrelated to anything that happens in the book. What’s next– This is the start of the legendary and always talked about battle between a crazed Iron Fist and the Black Panther. Continuity- By now everyone knows I’m a continuity whore. I know my history and love when writers don’t gloss over what happened in the past but instead use it to enrich the story. This issue takes place after Junzo Muto a terribly underused and underrated martial arts prodigy stripped Iron Fist of his powers and left him a simple martial artist. This becomes how Black dragon takes control of him by restoring his chi based powers, driving him mad and setting him loose to kill the panther. 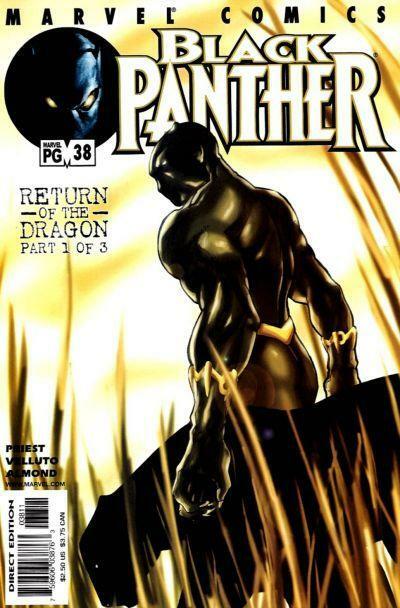 Respect- This issue also points out why the Panther when written correctly is such a force to be reckoned with. His plans within plans under writer Christopher Priest really is the benchmark by which all others are judged. Classic Misty Knight and Coleen Wing are also a cool addition. Looking back though at their design it really isn’t or wasn’t nearly as good as the recent update in Daughters of the Dragon. Action– Pretty damn cool is the best was to describe some of the fisticuffs that take place this issue. Unfortunately by modern standards this book is heavy on the exposition.